It is a cliché that often comes out around this time. While fans are frothing at the mouth for their club to loosen the purse strings and add to their squad, managers trot out the usual line to curtail supporters’ hunger. “Let’s not get carried away about making new signings, we have player x coming back and he is like a new signing,” says [insert generic manager name here]. For Arsenal fans, given the club’s injury record, it is a cliché that is perhaps all too familiar for them. However, this time around, it should be filling them with optimism rather than an impending mood of regret. And that is because, as we begin to sink our teeth into 2017, we have been greeted by news of the return of Danny Welbeck. For Welbeck, his career at Arsenal has not been the most fortuitous so far. In fact he has had more bad luck than the famous Roy Sullivan who, for those of you who don’t know, was struck seven times by lightning. The odds of that happening are around 22,000,000,000,000,000,000,000,000 to 1. It is Welbeck’s injury record that makes for pretty grim reading and explains his woe while being at Arsenal. 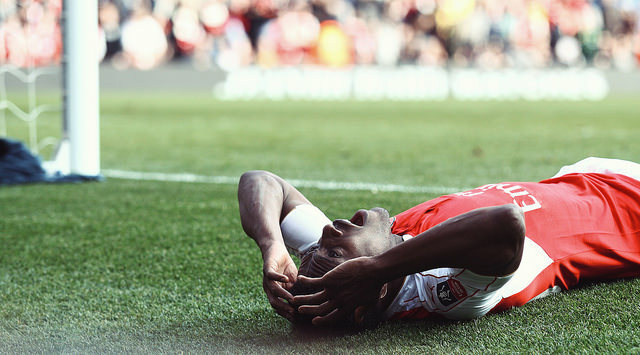 Indeed since joining the Gunners in the summer of 2014, Welbeck has spent 557 on the treatment table. The last of those stints came in May of last year when the striker was sidelined for a predicted nine months after suffering cartilage damage to his knee. That came just three months after Welbeck had returned from 154 days out due to another knee problem. The good news, at least, is that Welbeck has returned from his latest injury two months ahead of schedule to give an untimely boost to Arsène Wenger and his team-mates. You only need to glance at Arsenal’s social media output to see how popular Welbeck is among the squad. Indeed Jack Wilshere, who knows the 26-year-old from their time at England, is said to have played a prominent role in getting him to leave Manchester United for North London. Welbeck’s return to the dressing room, with his signature big grin, will undoubtedly be a morale boost for the players, but it is on the pitch that supporters will really see what Arsenal have been missing. Given his lengthy spells out it seems difficult to remember just what Welbeck has to offer, but if we look back over his time at Arsenal there have been flashes of the talent both Wenger and Sir Alex Ferguson see in the player. For me the night that always sticks out is Welbeck’s hat-trick against Galatasaray in the Champions League back in October 2014. It came just five weeks or so after he signed for Arsenal and, yes it was ‘only Galatasaray’, but it was a mesmerizing performance. Welbeck terrorised the Turkish defence and it was quite the sight to see an Arsenal forward with such pace reeking havoc. It even had some journalists comparing Welbeck to Thierry Henry. Okay, maybe that was a little too much, but since then we have seen other aspects to Welbeck’s game. For England he has been deployed in the role I prefer him – out wide. It is there where I believe his talents a best utilised. Blessed with pace and an insatiable work ethic, Welbeck is in many ways the perfect modern winger. He can beat a man around the outside and put a cross in, but he just as equally can stick the ball in the back of net. 14 goals in 34 England games is proof of that. Crucially for Arsenal, Welbeck’s work out wide gives such balance to the team. As much as I enjoy Alex Iwobi going forward, you cannot deny defensively he still has a lot to learn. He is undoubtedly partly to blame for Nacho Monreal’s dip in form as his work rate going back does not quite match that when he has the ball at his feet. This cannot be said for Welbeck, who is a tireless worker with or without the ball, and his return can bring the small percentage that is missing to Arsenal’s game at the moment. People can moan and shout for the club to spend money on the likes of Andrea Belotti or Julian Draxler, but I have to agree with Wenger here. What is the point in spending north of £30m on a player when we have someone like Welbeck returning. At 26 he still has time to grow and, before that injury last May, he had scored five goals in 16 games during the three months he was fit. So as we watch the clock until the January transfer window slams shut, lets forget about begging for a new signing on deadline day and appreciate what we have coming back. P.S. For those of you wondering Roy Sullivan amazingly survived the seven separate occasions he was struck by lightning before eventually dying in 1983. This entry was posted in NewsNow, The Bergy Blog and tagged AFC, Arsenal, Arsene Wenger, Champions League, Danny Welbeck, Gunners, Injuries, Iwobi, Manchester Utd, Premier League, Transfers, Wenger. Bookmark the permalink.